So, last year I focused on getting my Dark Eldar painted enough for fully painted games and am down to around 1k points left. I thought that this year I would change it up a bit and do monthly focus on a particular army. January: Space Marine Month. I will finish as much of my daughter's space marine army as I can. February: Back to Dark Eldar. As part of an escalation league, we get points for painting up models so will work on the last 1k of DE. March: Tyranids. Same reason as above. My son wants to use the escalation league as a method to learn the new tyranid codex, and I can paint up some more models for him. Speaking of, I finished up the salamanders this morning. Suitable fluff/update to the Peace Marine WIP this evening. Have to head into work for a bit now. I can't get over how good those scouts look ! Good idea with a monthly focus, I like it! The scouts were very interesting to paint. Very different from tacticals and I couldn't really find pictures anywhere, so went with the description in the novel I just read as best I could remember. I plan on doing some weathering/damage on my trench board today and maybe lay some sand since it is warm today but supposed to snow tomorrow. Painting this thing may be a problem if it stays really cold in the garage, but I will try. 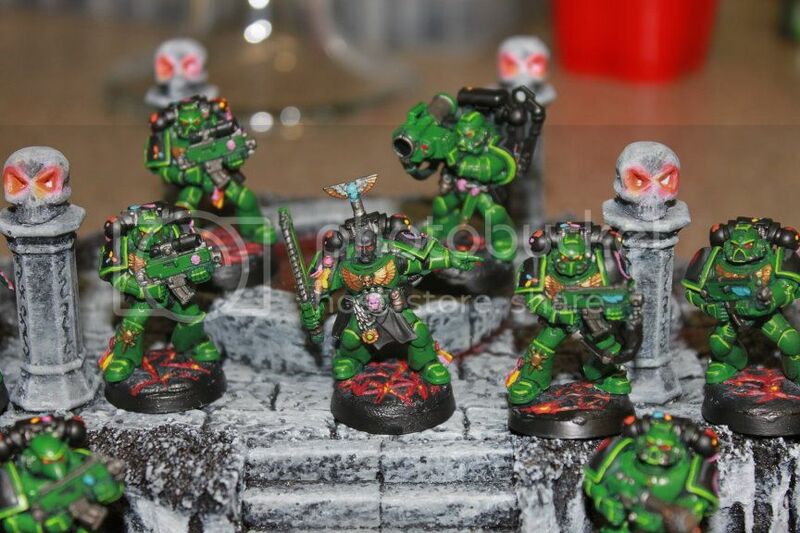 The Monthly focus is a pretty swell idea, but i am still so distracted by how good your Salamanders, especially the scouts, look. and those Bases are phenomenal. Just good work all around Nappen. Thanks, it has been in the 20s and 30s but in the 40s today, so a good day to do stuff. Supposed to get really cold tomorrow and snow. Glad I'm down here in Texas then! Hasn't even gone out of the 50s all month! I have to agree, I'm stunned with how good the salamanders are. If you didn't make them Peace Marines then you'd certainly have a nice starter force on your hands! Here is something I heard about for lava bases that you may want to try out for fun: Paint the base completely in lava colors, random swirls of red, yellow, orange, etc. Then take the new Agrellan Earth technical paint, and mix in some Eshin Grey or black paint. When you put that down over the lava it will look like flaking lava crush! I am having a really hard time deciding how to do the walls of my trench board. I could tear up some cardboard boxes and use the corregated material, but not sure how long that will last. Would love to do pastruct, but I would need around 10 sheets and that is more than the foam cost ...Maybe magic sculpt on the walls and then carve in diamond plate patterns...I just don't know. what walls on the trench board are you trying to decide about. the walls in the trenches, or the walls on the bunker ? Oh, in the trenches'. I think I will just use corrugated card stock for some areas and plain plasticard I have laying around for some others. Nappen wrote: Oh, in the trenches'. I think I will just use corrugated card stock for some areas and plain plasticard I have laying around for some others. what about Popsicle sticks ? I just ordered some stormvermin for my rat horde I will paint up in the spring. Dez, you still up for a blogging duo rat clan painting project? Hobby Lobby has sheets of plastic/plasticard that come in a diamond pattern, would look great I think. Heh, in that case screw that noise! Minis are expensive enough!